OMG! Is THAT our route? 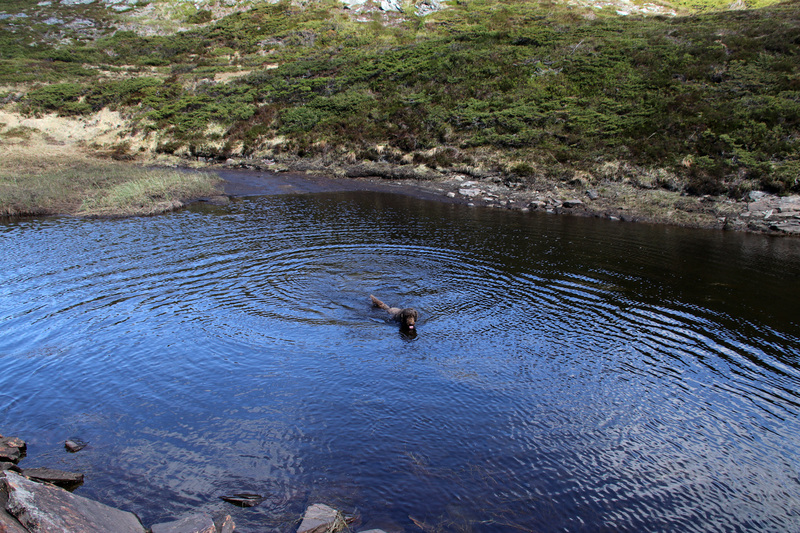 My last day of the Hyllestad-weekend. The status so far was 10 new tops, which was my original goal. Ahead of schedule, and a beautiful day for hiking, I planned to “bag” 2-3 new tops before taking on the long drive back home to Sunnmøre. 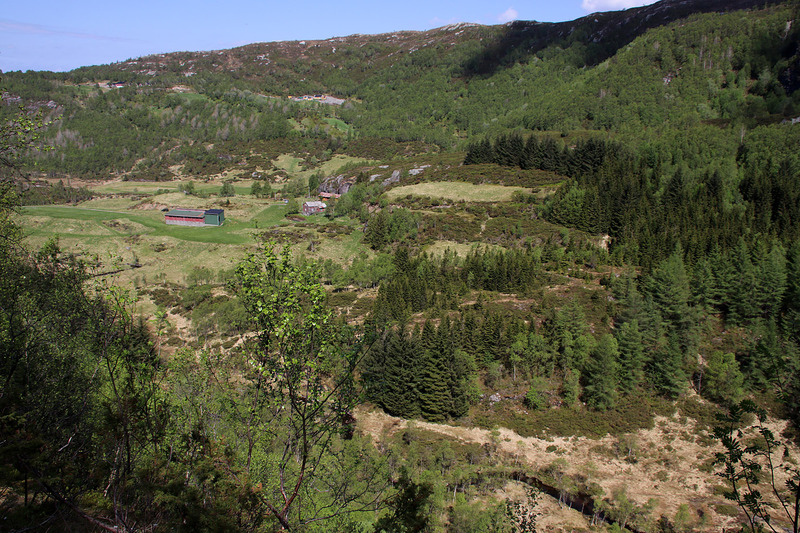 Kvimsen had been on my to-do list all along, but I had dreaded it – as I had seen nothing but dense bush and forest from several angles. Then I talked to the family that I rented the cabin from, and they advised me to hike the forest top from the southeast. They told me the forest was quite gentle, and I decided to give it a try. I drove along Saltbuelva river for 1,2km until I saw a cabin on the other side of the river. That was my starting point. 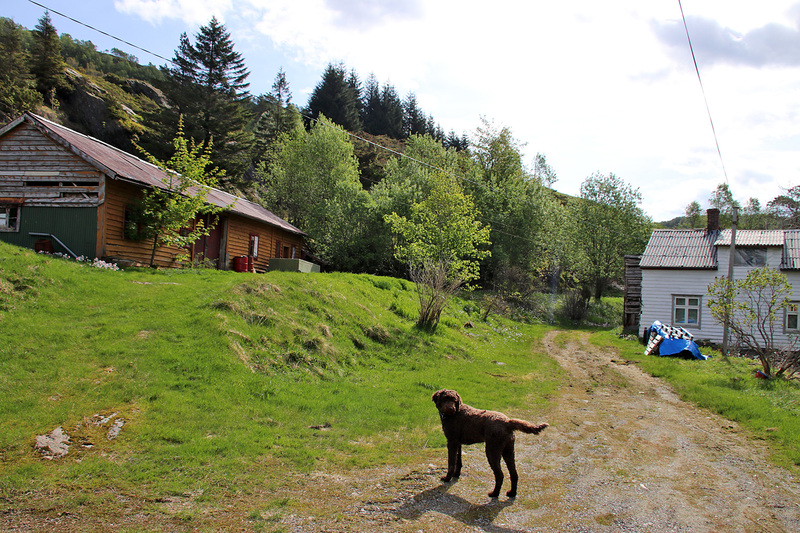 I found parking alongside the road and crossed the river on a bridge, leading to the cabin. 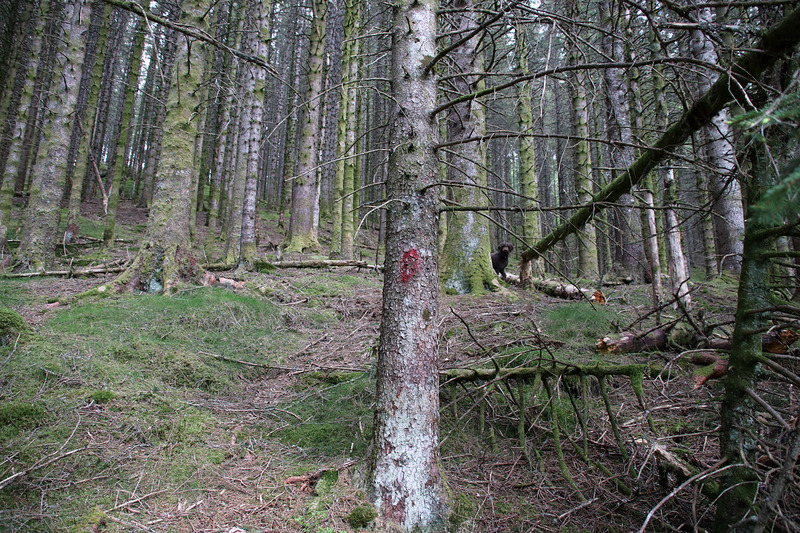 Here, I found a marked path up the forest. 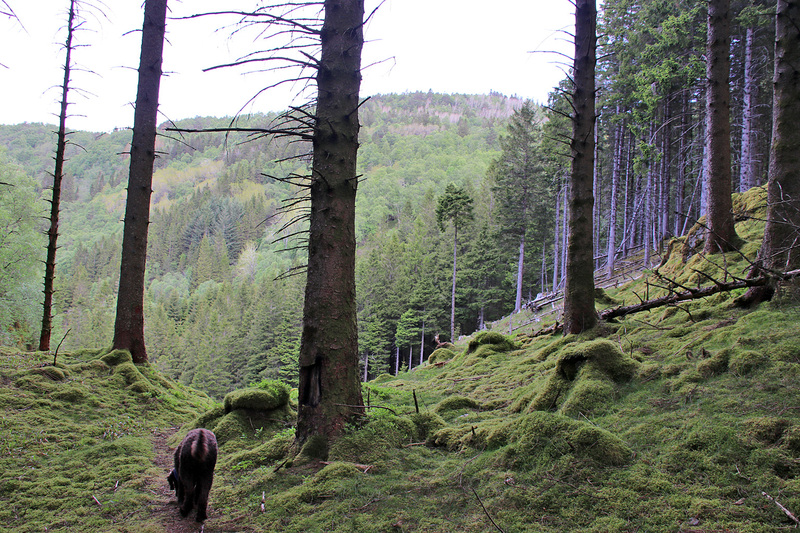 Once I reached the ridge, I could see a very bushy forest top ahead of me. But the advice said to follow the ridge upwards, which I did. And indeed, the forest was quite gentle. I had no problems whatsoever. 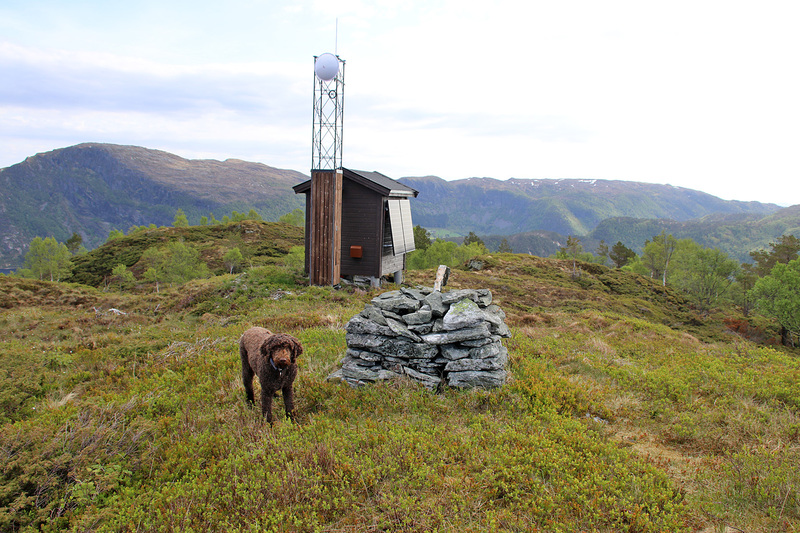 Eventually, Karma and I reached the antenna on top of Kvimsen. The views were all good (although quite familiar after two days of hiking in this region) and I was happy to have reached the first top of the day. 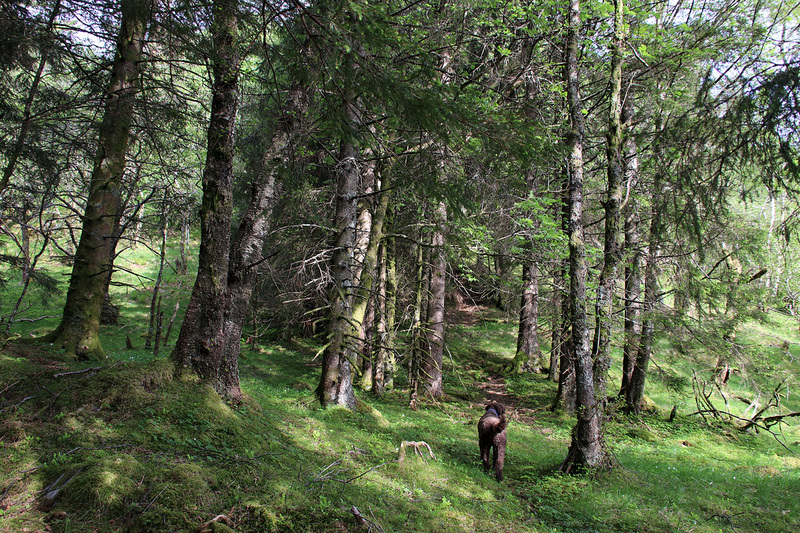 We descended along the ascent route. I hadn’t paid too much attention to details (as there were quite few of them) and had to take a look at the GPS every now and then to make sure I was on the right track. 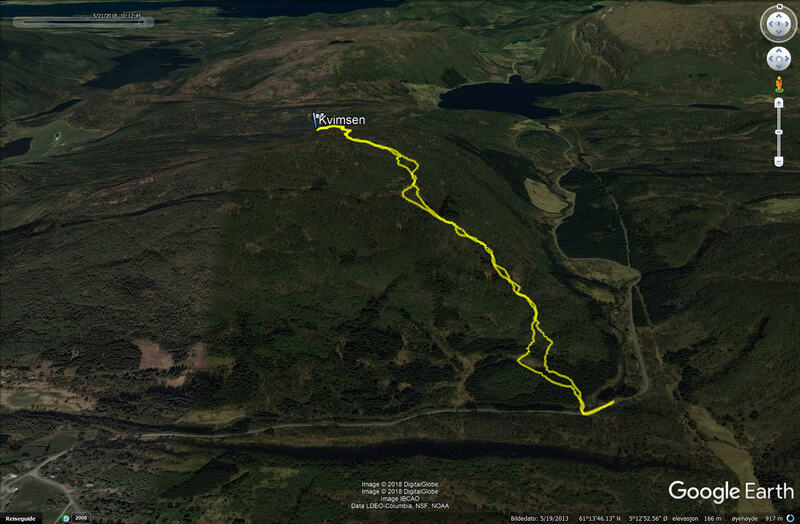 Trip statistics: 3,4km, 340 vertical meters, 1 hour. My next goal was Høgeheia. I continue up RV607 and soon turned right towards Sundbotn. This was a long, but OK gravel road. 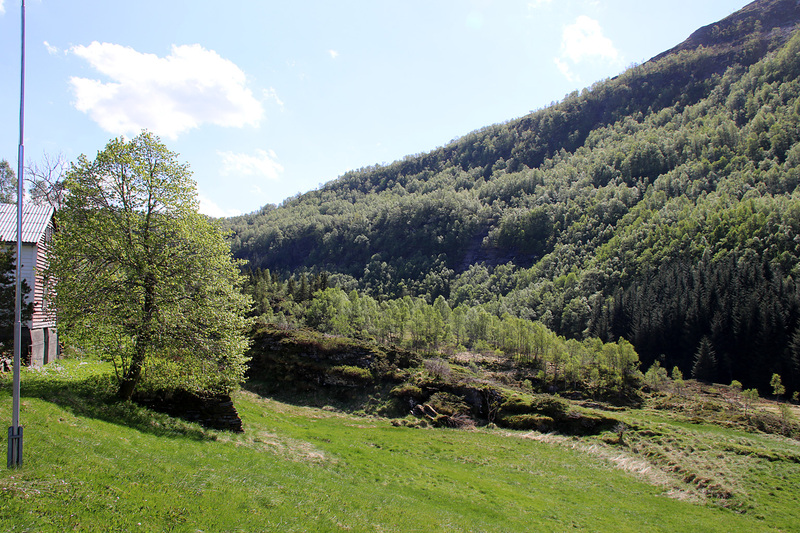 No one lived in Sundbotn any longer, and I felt free to park by the farm. 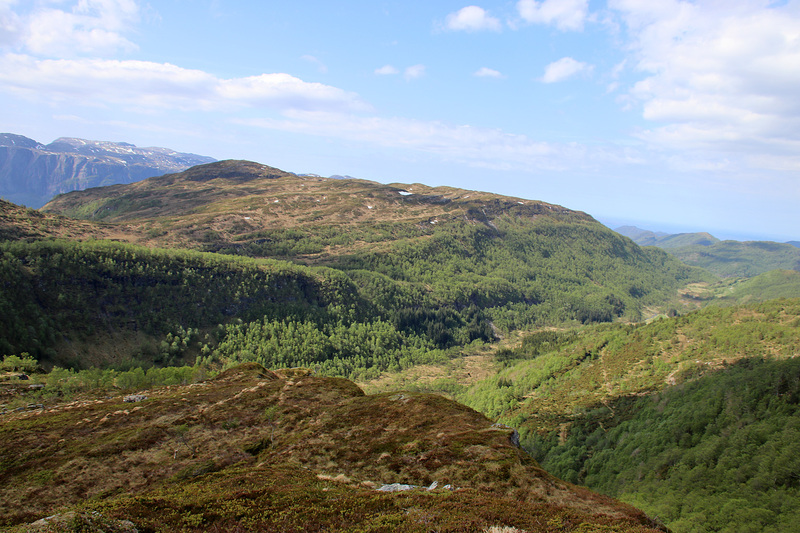 My map said there was a path from the farm and to the top of Høgeheia. Very promising! I saw a tractor road and assumed I should follow it. That was a mistake. 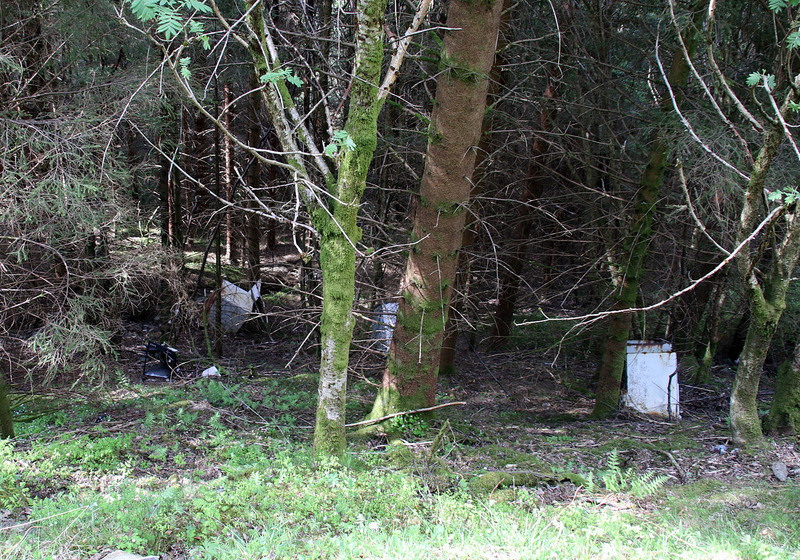 Below the tractor road I saw a whole lot of littering that made me really depressed. I tried to understand it from the days and age when the littering took place, but I still couldn’t understand it. Once on the ridge, I found the path and followed it upwards. Happy to be on the right track, and happy from spotting the snake in time. Soon after reaching the top, a woman suddenly appeared. We were both “shocked” to see other people up here. She had hiked up from Ytreskor, which was my original plan. But after Kvimsen, Sundbotnen meant a much shorter drive. 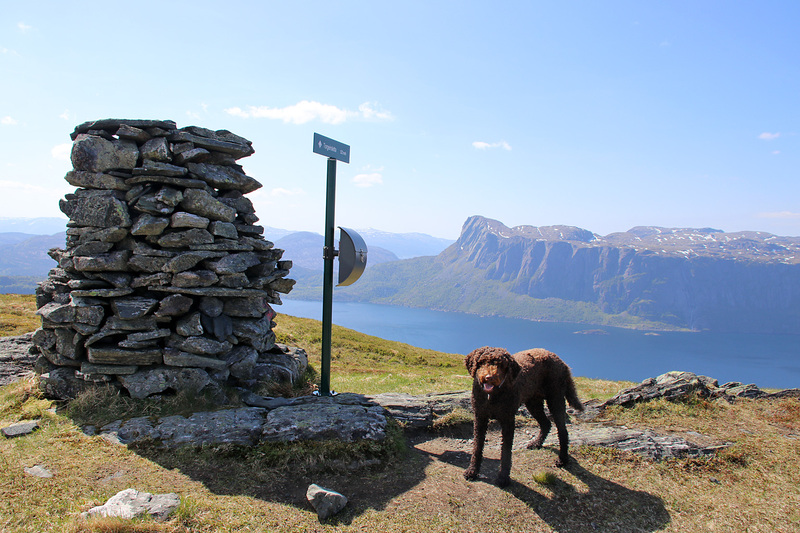 We chatted for a little while and I told her that now that I was up here, I might as well hike Torgersletta. She wished me good luck but could not promise me nice terrain along the way. 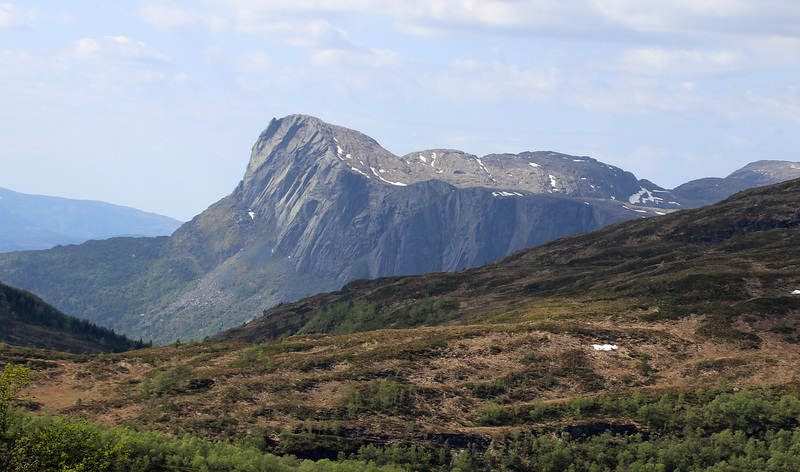 When we reached Torgersletta, I knew that this was the last top this weekend. 13 new tops in approx. 50 hours wasn’t half bad. 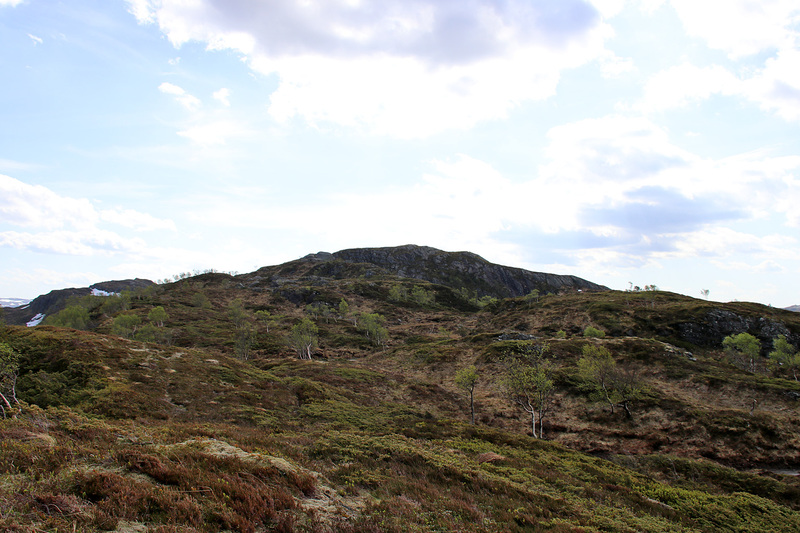 It was *really* tempting to hike down the marked path to Øen, and ask the Øen family (from whom I had rented the cabin) if they could drive me back to Sundbotn. I am sure they would have, but I ended up with a plan that seemed ridiculous, and thus, was too tempting to choose. 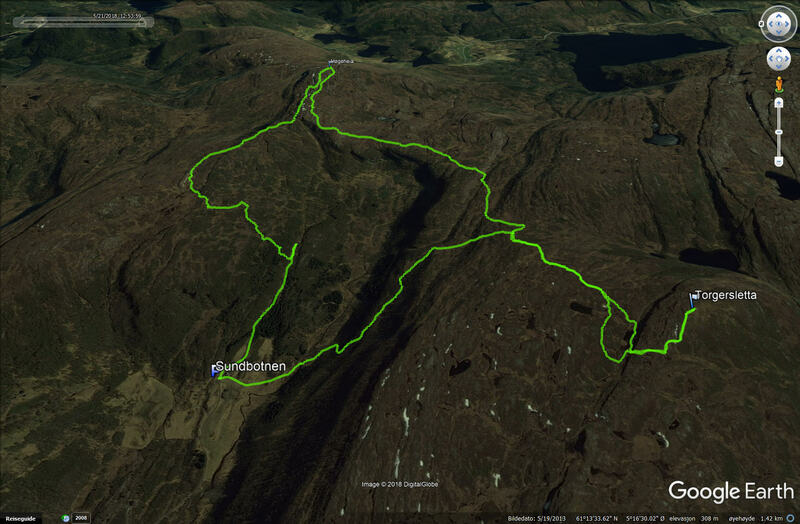 On my GPS map, there was a marked path down to Sundbotn. I didn’t for once second think it had been used for many, many years – hence hard to find and follow. Moreover, I had to find my way down a really steep cliff. In other words, a “fun” challenge. Of course I never found the path. But I used my GPS to make sure I followed the invisible path. At least it should get me safely down the cliff. Fortunately, the forest wasn’t all bad and when I got to the point where the imaginary path went “off the cliff”, the terrain was easy enough to descend. Once down by the creek, I almost stepped on another snake. I jumped over it and shouted to Karma to stop. She did. 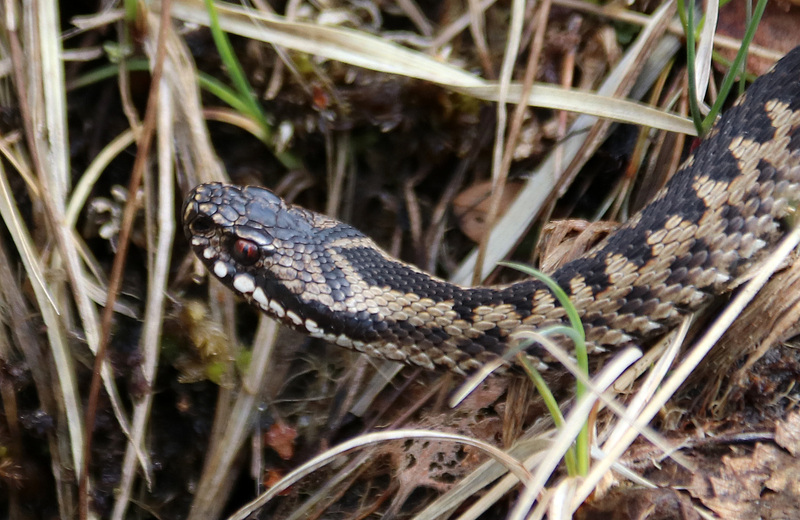 The snake did not seek confrontation and soon we were back by the car in Sundbotn. Trip statistics: 9,5km, 470 vertical meters, 2h:27m. You shot some beautiful pictures. My daughter was in Norway a couple of days ago she returned to London. 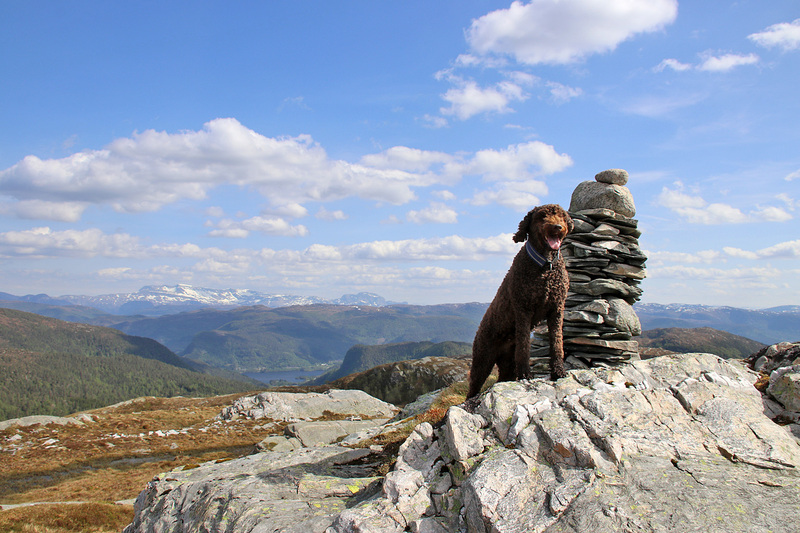 She loved Norway so much and wants to go back to live there. She is having high hopes that she will realise her dreams. I have seen pictures and I am loving it, but I will holiday there, but I won’t live, too cold for me hmmm! 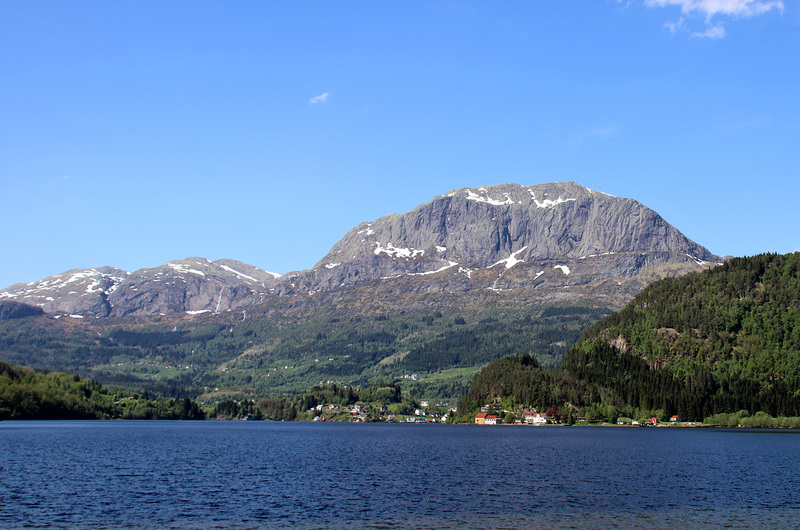 Norway is a beautiful country! Keep the pictures coming. Have a nice weekend! Nice to read from you! Will read again your blog.